Windows 10 comes with a slew of pre-installed apps, the usefulness of which will vary from user to user. Most of the less useful apps, such as “Get Office” for example, include their own right-click uninstall option. However, some do not, and this is where third party removal tools can come in handy. Click whichever app you want to remove, click Yes when prompted “Are you sure you want to Uninstall this app?”, and voila! If, for some reason you change your mind later on down the track, simply click the Reinstall button. *NOTE: I’m not sure how the Reinstall feature works – clicking an app’s icon only provides the option to Uninstall, seems there is no option to selectively reinstall a specific app. Maybe the software identifies any missing apps and re-installs all previously uninstalled apps. Frankly, I have no idea, and the relative question I posted on the 10AppsManager forum several days ago remains, as yet, unanswered. Positives: *Provides a simple one-click operation to remove unwanted apps *Free and Portable. Negatives: *The listed apps also include any which have already been uninstalled. Even when you use this software to remove an app, it still shows up in the list. Personally, I don’t have a major problem with the Windows 10 apps. They are, for the most part, small in size, unobtrusive, and quite easily disabled. Furthermore, as I mentioned in the intro, many of the apps, especially those of the less useful variety, include their own right-click uninstall option. 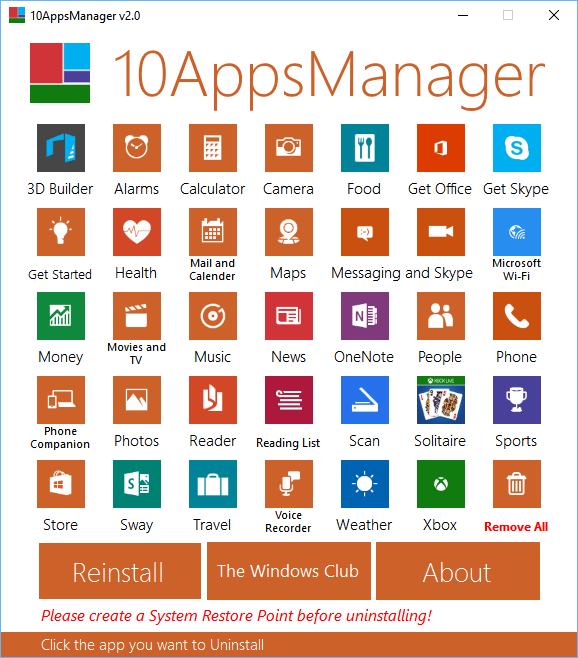 However, for those who don’t like or want the Windows 10 apps, this tool does simplify their removal. Please bear in mind that removing some apps (known as ‘system’ apps), such as the Store app for example, may be problematic to reinstall. Removing these apps may also cause undesirable side effects. Thus, I reiterate the cautionary note included in 10AppsManager’s interface… make sure to create a System Restore Point before uninstalling. Still no response after almost a week Tom. Yes, if and when they respond, I’ll post the information back here… no problem.